For this version of the marketplace, we have overhauled the GUI in order to provide players with an easier way to navigate the marketplace and search for specific items, so they can find exactly what they’re looking for, and how much of it they want. The new improved marketplace has plenty of parameters by which players can search for items, including the category and tier of the item. Players can also now search for an item with a certain spell on it. In Albion Online, players craft spells onto items during the crafting process, choosing a number of different spell combinations to hone one particular kind of skill, or diversify the combination to create a more tactical item. It may be that one player finds a particular combination or particular spell which they really like, or that they think will complement their current load out. If they’re looking to splurge on a new item at the marketplace, they might want to filter their search results to only show items which have that particular spell crafted onto them. THE GUI OF THE MARKETPLACE HAS BEEN REDESIGNED TO LOOK MORE UNIFORM WITH THE GAME’S STYLE, AND MAKE IT EASIER FOR PLAYERS TO NAVIGATE AND FIND ITEMS. 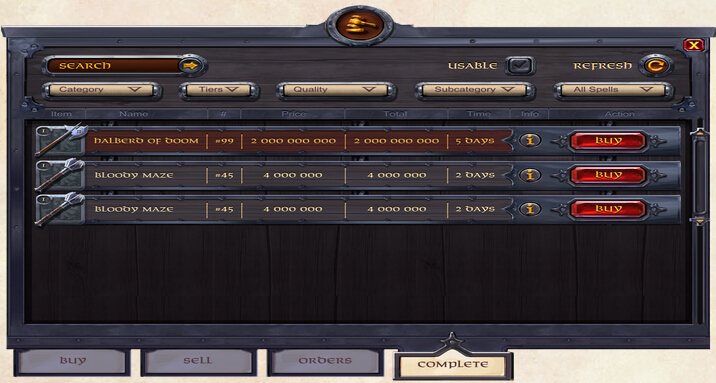 In the new Albion Online marketplace, players can do just that! The search options make it easy for players to find exactly what they want, by allowing them to search for a spell name, and be shown every item available which has that spell. They’ll also be able to see information such as the quality of that item, its durability level, and whether or not they have unlocked it and are currently able to equip it. The marketplace will also help players to make good decisions about their purchases, by notifying them if the durability on an item up for sale is noticeably low, or if the price the seller has set is significantly higher than the local average. We’re also intending the marketplace to be more easily accessible; as many communities as possible, including hub towns and player-driven cities, should have a marketplace where players can barter locally. Marketplaces are being kept local in order to push the transportation of materials and items as a worthwhile trade in Albion. As well as being able to put their items up for sale for a price, players are now given the option to create Buy Orders. Buy Orders function as advertisements within the marketplace, with players specifying an item and how much they are prepared to pay for it. This advertisement can then be answered by other players who have some of the item requested, with the price set by the buyer rather than the seller. When players wish to enter an offer, the system will check to see if there is not already a Buy Order available for that item, making it easier to achieve a sale quickly. Buy orders are quite flexible – players will not need to sell a whole Buy Order, or buy all of a certain item on offer. They can complete purchases in parts, making it easier for both buyer and seller to get exactly what they want out of a transaction Or Use Albion Online Gold. Previous: What is Albion Online?